DURHAM -- Getting nearly 70 musicians to harmonize is difficult enough when the players are standing still. Achieving this while the musicians do choreographed steps presents even more of a challenge. Add to the mix the high-stepping dance moves required of marching bands at historically black colleges and universities, and you get a description of just one of Jorim Reid’s many job duties. N.C. Central University named Reid band director this month for the 2001-02 school year. 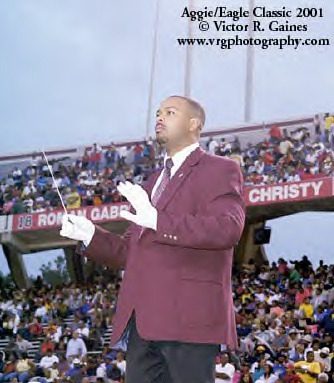 He came to NCCU last year as the assistant director, instructor and musical arranger. With marching-band season in full swing, Reid is busy preparing his troops for their first performance Sept. 1 during the Aggie-Eagle Classic in Raleigh. Although he anticipates about 100 students -- including musicians, color guard and dancers — to join the "Sound Machine" this year, Reid won’t know the actual size of his band until September. "I’ve been doing recruiting for the past three weeks," he said, adding that so far he’s seeing more students this year than last. "I and two other students called [potential members] at home. We’ve gotten a few transfer students. ... We also recruited students on campus." As director, Reid not only oversees the marching band; he also leads the university’s concert, pep and symphonic bands. In addition, Reid does most of the bands’ music arranging, travel and performance scheduling and anything else needed to get his players’ music heard locally and nationally, since he has no staff to assist him. "The position should not come without an assistant," he said. "They wouldn’t have a football coach without an assistant, and I have more kids than they do. But I’m walking by faith, not by sight. If I didn’t do that, I wouldn’t be here." Frank E. Williams, interim chairman of the music department, said officials are working to get Reid an assistant but must wait until the General Assembly approves the state budget and sets university spending levels. In the meantime, music professors, he and others will step in to help Reid where necessary, he said. Reid has already assigned a group of students to copy and distribute music, clean the band room, register students and hand out music and uniforms. Band boosters also have helped in doing inventory, chaperoning and providing meals for students, he said. "I’m a strong believer in student involvement. Cleaning the band room gives students a sense of ownership," he said. "My part is to teach them music, musicianship, character and help [them] develop talent and creativity." Musical arrangements written by Reid will have the band playing a diverse range of styles from contemporary to classical, hip hop to traditional marches. Selecting and adapting an original piece of music to fit a band’s style and skill level takes a good ear and strong background in music theory, Reid said. "Arranging is very intricate, especially for [historically black schools]. You can play a commercial arrangement which sounds square, but you have to add a little soul to it," he said. Mainstays of band repertoire, however, won’t be neglected. "It’s important that a band play marches like "Stars and Stripes." That’s how you learn to play your instrument." Not yet 30, Reid received a bachelor’s degree in piano from Florida A&M University and a master’s in music education from Florida State University. One of Reid’s mentors at FAMU, Lindsey Searjeant, arranged music for NCCU bands in the 1970s. Williams said Reid beat out other applicants for director because of his vision for the band, as well as his demeanor, confidence and energy. "I feel that Mr. Reid brings a lot of knowledge and experience to the program even though he’s young," said Ronnie Chalmers, band drum major. "I’m looking forward to growing in size in terms of our musical ability and creativity." Jason Johnson, a sophomore who plays tuba, said this is the year the Sound Machine will craft a solid identity among listeners. "This year, I look forward to people associating musicality and creativity with the Machine," he said. "When they hear the way we play our music, they’ll know it’s us."